The 16th Century clock tower of Notre-Dame de l'Esperance in Old Cannes, Provence, France. Lit up at night in the old town of Cannes, the clock tower of Notre-Dame de l'Esperance stands out like a beacon. 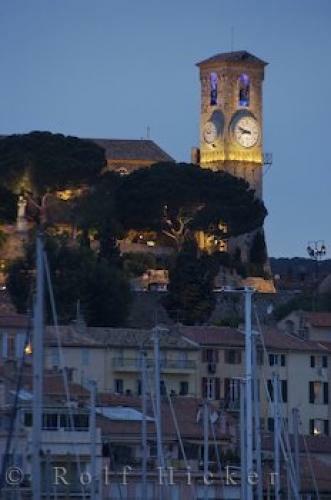 The 16th Century clock tower has become a symbol of the old town of Cannes perched on the hill of Le Suquet. The church, Notre-Dame de l'Esperance, affords great views of the bustling town of Cannes and the bay. Clock Tower in Old Town, Le Suquet, Cannes, The Riviera, Cote d'Azur, Provence, France, Europe. l'Esperance in Cannes, Provence, France.